Description: Chione. Here is a duplicate 35mm color slide via Al Chione that was taken near Vail, Pennsylvania, on 4 May 1957. The photographer is not identified. Shown here is Pennsylvania Railroad engine #4230, an I-1SA (2-10-0) "Decapod" built by the Baldwin Locomotive Works as an I-1S during June of 1923, rebuilt in Juniata as an I-1SA in August of 1934, and retired in October of 1959 after 36 years of faithful service. Close observation reveals that there is a rear-end pusher locomotive adding to the drama! Description: Chione. Here is a duplicate 35mm color slide via Al Chione that was taken near Duncannon, Pennsylvania, on 24 July 1955. The photographer is not identified. Shown here is Pennsylvania Railroad engine #6727, an M-1A (4-8-2) "Mountain" built by the Baldwin Locomotive Works during 1930 and retired in August of 1956. It is pulling a westbound mixed-cargo freight train along the eastward-flowing Susquehanna River. Description: Chione. Here is a duplicate 35mm color slide via Al Chione that was taken near Mount Union, Pennsylvania, perhaps during 1954. The photographer is not identified. Shown here (L to R) are Pennsylvania Railroad engines #9875 and two more "F" Class units whose numbers are not recorded. All are EF-15A's built by GM-EMD and rated at 1,500 horsepower each. #9875 was built in September of 1952 and retired in October of 1967 after just 15 years of revenue service. Westbound merchandise freight, rockin' 'n' rollin'! Description: Chione. Here is a duplicate 35mm color slide via Al Chione that was taken in Englewood, Illinois, in December of 1949. The photographer is not identified. Shown here (L to R) are Pennsylvania Railroad engines #8949 and three GM-EMD "F" units whose numbers are not recorded. #8949 was built in Juniata as an H-8C during March of 1912, rebuilt as an H-9SC in February of 1916, rebuilt as an H-10S in April of 1920, and retired in May of 1950 after 38 years of faithful service. Nothin' like some steam-powered help on a freezin' Winter's morn! Description: CP 255 rolls off the International Bridge (built in 1896) after crossing the Niagara River into Canada. Description: Looking a bit more like a typical high hood GP7, Housatonic Railroad #22 - an ex-Montreal, Maine & Atlantic, ex-Bangor & Aroostook, nee-Atchison, Topeka & Santa Fe GP7U - pulling a one car Housatonic Railroad Job NX-11 past the old West Cornwall Depot. Description: Morris Park Shops, Jamaica, New York, USA, 24 September 1978. 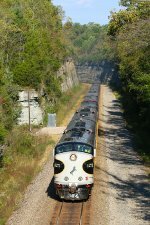 Description: A westbound train rolls by Kansas City Union Station. LMX B39-8E 8577, ATSF GP20u 3032, and GWWR GP38 2037 make for an interesting head-end locomotive consist. Description: Freshly painted UP AC4460CW 7319 and SD70M 4992 lead Pine Bluff to Mexico manifest train MPBMX-13 on the former Cotton Belt out of Big Sandy. The Chicago, Rock Island and Pacific Railroad (CRI&P) is connected to the Chicago, Burlington and Quincy Railroad (CB&Q) at Ottawa, Ill., which is on the Streator Branch 41 miles west of Montgomery. A few days before the accident, CRI&P trains started detouring over the CB&Q tracks between Ottawa and Chicago because of a defective CRI&P bridge over the Des Plaines River at Joliet, Ill. Some time before 8:45 p.m. on the day of the accident, CRI&P passenger trains No.4 and No. 10 were combined at Ottawa to detour eastward over the CB&Q to Chicago, via Montgomery interlocking. This combined train, consisting of six CRI&P diesel-electric units and 19 cars, operated on the CB&Q as Extra RI 656 East. It left Ottawa at 8:45 p.m. with a CRI&P engine crew, a CB&Q engineer-pilot, and a CB&Q road foreman of engines in the control compartment at the front of the locomotive. A CB&Q conductor-pilot and a CRI&P train crew were at various locations in the cars. Approximately 2 hours after leaving Ottawa, Extra RI 656 East arrived at Montgomery interlocking, where it stopped on the Streator Branch main track with the front end 675 feet west of switch 14 and 195 feet west of signal 24-23, which indicated Stop. About the same time, the men on the locomotive saw a detouring westbound CRI&P passenger train, Extra RI 634 West, stopped on track No. 1 east of the interlocking station. A few minutes later, they saw the headlight of No.3, a west-bound CB&Q passenger train, approaching on track No.2 and surmised that their train would be routed eastward on track No.2 after No. 3 passed. While Extra RI 656 East was waiting for No.3 to pass, a warning device sounded in the control compartment of the first diesel-electric unit and the CRI&P fireman went into the engine room of this unit to determine why the warning device had sounded. Immediately after the fireman left the control compartment, the CB&Q road foreman of engines noticed No.3 had been diverted to the Streator Branch main track at switch 14 and was closely approaching at high speed. He promptly called a warning to the CRI&P and CB&Q engineers and ran to a side door of the control compartment, where he started to jump from the locomotive. Before he could jump, however, No.3 struck the front end of Extra RI 656 East, killing the CRI&P engineer and the CB&Q engineer-pilot. The CB&Q road foreman of engines and the CRI&P fireman were injured. Number 3, a westbound first-class passenger train, consisting of 3 diesel-electric units and 15 cars, left Aurora at 10:45 p.m., 3 minutes late, and proceeded westward on track No.2. A few minutes later, it approached Montgomery interlocking at 63 miles per hour, as indicated by the speed recording tape. The engineer and fireman were in the control compartment at the front of the locomotive, and the other crew members were at various locations in the cars. Signal 5-3 indicated Proceed as the train approached Montgomery interlocking, and this indicated to the enginemen that the route was lined for movement of No.3 through the interlocking on track No.2. The route, however was improperly lined for movement of No.3 from track No.2 to the Streator Branch main track, via switch 14. The engineer apparently first became aware of this when the train reached the area of the interlocking station at which time he initiated an emergency brake application. A few moments later, the train passed the interlocking station, entered the Streator Branch main track at switch 14 and, while moving at 52 miles per hour, struck the front end of Extra RI 656 East. Description: Just by luck, I catch the road power leaving Brooks with the usual contingent of late model geeps. 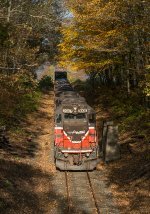 Description: CMQ eastbound 710 crosses the South Bay trestle in Newport, Vermont. Today's train consists of LTEX GP38-3 3815, LTEX GP35U 2573, and 21 cars of mixed freight. 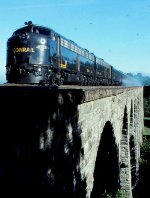 Description: UP 844 speeds under the signal bridge near Reynoldsville,IL. Description: NS OCS is southbound at Kings Mountain. Description: 201 car monster WB road train.. Title: SP 3855 running over UP rails to Los Nietos Junction. Description: Rebuilt GP-9 with fresh paint and the full array of SP lighting. Description: A late-running Southern Railway No. 58, the New Orleans-Meridian local, was entering the siding at Slidell during a very unusual south Louisiana snowfall. The train was running with GP38 2796 and GP30 2528, and was here to meet piggyback train No. 219. The track on the other side of the 2796 was the south leg of the Slidell wye. The wye's tail track served the American Creosote Works plant, which later became an EPA Superfund site. The wye was subsequently removed. Description: The intercity train to Interlaken in front of the mountain Niesen, with a nice snow top. On the front of the train (left side) a so called "extension module" of a coach and a cabcar, which is used when heavier load is anticipated. Description: 5146 was the newer power leading this long SCL freight at Port Wentworth, Ga. in 1980. It has stopped briefly waiting for permission to go to Savannah. Description: Just your average Indiana Rail Road train heading south through Bargersville, IN. Description: A set of Southern SD 40s rolls south through a pair of NW signals with a grain train on the NW Shenandoah Sub, showing the effects of the NS merger four years earlier. Long hood forward was standard practice on the Southern and N&W, so the leader is not running backward. Description: This southbound throttles up as it passes the Pomona Yard office in a mid afternoon thunderstorm, its ground crew relieved there will be no work for them here today. An SD 40-2 and two 45's make up the power. Description: Captrain Italia E.483 302 hauling a chemical tank container train of Getras from Mantova Frassine to Novara Boschetto. Description: WAMX 4221 handles a short local freight on WATCO's new Kanawha River Railroad. Description: A Kershaw-bound train aproaches Manor Dr. in Lancaster in a South Carolina snow storm. This surprised me hen I was uploadig to RRPA as I realized they wereusing their three SW900s togther. Description: Minuetto, Bo-2-2-Bo class ALe501, an EMU of Trenitalia. Title: POWA 608 Approaches Mill Rd. Description: POWA w/ MEC 608 - HLCX 8147 - MEC 605 - HLCX 7843 and about 75 cars crosses Mill Road in North Yarmouth Maine. Description: It's funny to see how some people could'nt care less about the NYS&W doing some "Street Running"! Description: The scenic highlight of the trip is Box Canyon trestle and dam. The bridge was built in 1911, the dam just below the bridge in 1955. The train stops on the bridge for a few minutes to let passengers take in the sights. Despite the scenic wonder, maintenance on this bridge is the main reason this run is ending after 2016.